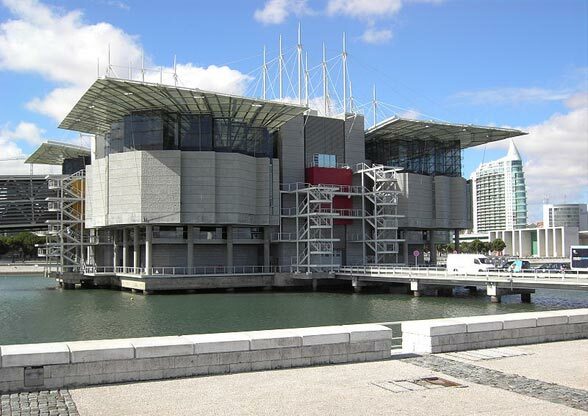 The Lisbon Oceanarium or ‘Oceanário de Lisboa‘ was built as part of the development for Expo ’98. Situated in the Parque das Nações, it was in fact the centrepiece of the Lisbon World Fair and is also the largest oceanarium in Europe. Anyone coming to the Parque das Nações will not want to miss the Oceanário Lisboa. It houses 16,000 plants and marine-life encompassing 450 different species. The aquarium comprises a huge central tank, surrounded by four other tanks, each one recreating an ecosystem from four different coastal habitats. They hold representative species of flora and fauna drawn from the Antarctic to the Indian, Pacific and Atlantic Oceans. Sharks, barracudas, tuna, a huge Sunfish – and backstage tours! The central exhibit, the Global Ocean tank, is 1,000 square metres and 7 metres deep. This massive container holds several hundred species from around the globe, including species of shark, barracudas, tuna and other large aquatic creatures. Look out for the Sunfish, one of the main attractions here. Apart from the displays, the Oceanarium offers a backstage tour lasting 45 minutes. Knowledgeable tour guides take visitors to areas behind the scenes. Here, one can see how the staff do their jobs to take care of some of the inhabitants. You can also learn more about the Oceanário’s exhibits on a guided tour in the company of a marine educator who can tell you all about the exhibits in the Oceanarium. However, if you prefer to wander around on your own, there are audio guides that you can rent. The Oceanarium offers many other events and fun activities such as a sleep-in next to the sharks for children. Over a million people visit Oceanário Lisboa each year which speaks for the popularity of this Lisbon attraction. The Oceanário de Lisboa is located in Parque das Nações, at the south end of Doca dos Olivais. The most convenient way to get to Lisbon Oceanarium is on the Metro. Hop on the Red line to “Oriente”, which is the last stop. The Oceanarium is a leisurely 10 minute walk from the station. Any of these bus routes will drive by “Oriente”, the nearest stop to the Oceanário. 5, 10, 19, 21, 28, 50, 68, 81, 82, 85. Enjoy this post? Leave a comment below and add to the discussion. Thanks!